When you hold one of our nets in your hand, the sleek, smooth finish is soft and the lightweight feel is surprising. But don’t be fooled by its beauty. Each net is strong, flexible, and guaranteed for life. With many different net options, you can fish any water for any fish – and know that your net won’t let you down. Blue Ribbon Nets takes pride in building a timeless fly fishing net that you can trust and pass down to continue your fishing traditions. 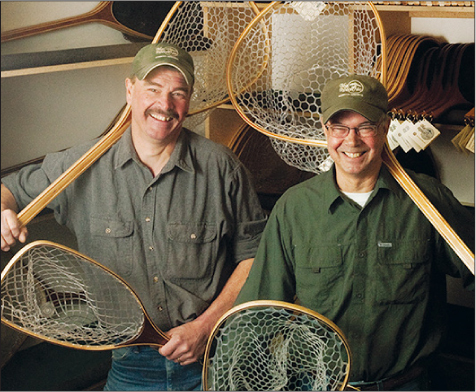 By crafting heirloom fly fishing nets locally, our goal is to make your fishing experience better one net at time. Living in Southwest Montana offers some of the best fly fishing in the world. Blue Ribbon Nets doesn’t take this for granted. Founded in Bozeman, Montana in 2000, we strive to provide you with heirloom products that can be passed down from generation to generation. Every net is hand crafted with honesty, integrity and quality. Here at Blue Ribbon Nets, all of our products – from the wood to the net bags – are made in the United States. Each slat of North American ash, cherry and walnut lumber are cut, steamed and bent then glued together to craft each net. In developing and manufacturing our own net bags, whether it be the soft mesh or BRN AquaFade Ultra Light, each is thoughtfully designed and developed to be long lasting and gentle on fish. This design and method of construction is unequaled in the industry. Each of our nets is handcrafted with pride in order to enhance the experience of your catch.